NEW YORK, NY--(Marketwired - December 19, 2017) - The rapid rise of ecommerce channels combined with growing number of choices to purchase goods is leading to unpredictable consumer shopping behavior. This market dynamic makes it imperative for retail and apparel brands to focus marketing strategies that will get consumers talking, which in turn drives traffic to their stores or their websites. 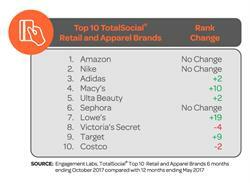 To help retail and apparel brand marketers better understand what consumers are saying in both their online and offline worlds, Engagement Labs has released its updated TotalSocial® rankings of social influence among retail and apparel brands in the U.S. The report looks at how each retail and apparel brand has performed in social conversations over the past six months, compared to the Company's previous ranking in May 2017. According to Engagement Labs' report, Macy's, Lowe's and Target all made their debut into the top ten ranking -- pushing Nordstrom, Under Armour, Forever 21 and IKEA out of the top ten. The analysis, which is unique in that it combines offline (face-to-face) and online (social media) consumer conversations, is based on Engagement Labs' proprietary TotalSocial data and analytics platform which continuously measures the most important drivers of brand performance in terms of social media and word of mouth conversations. Previously ranked at 14, Macy's climbed its way into the top ten at number four due to an increase in its online sentiment -- which indicates that consumers are speaking positively about the brand on social media. Within the last six months, Macy's announced a new marketing strategy which will focus on digital and ecommerce. At the same time, they also hired a new CEO, appointed former eBay vice president Hal Lawton as President and hired BBDO New York as its new creative agency. However, while Macy's made its way into the top ten, Nordstrom saw one of the biggest declines in the ranking. According to Engagement Labs' report, Nordstrom was pushed out of the top ten to number 20, previously ranked at three, due the controversy surrounding Ivanka Trump's brand and President Trump's ongoing tweets against the Nordstrom. This contributed to a decrease in Nordstrom's online scores, particular online sentiment as there was an increase in negative conversations about the brand. Target, previously ranked at 18, made its first appearance in the top ten at number nine. The Company saw a sizeable increase in online sentiment, as well as gains in online and offline brand sharing -- which measures how much a brand's marketing is being talked about. "Over the last few months, we're seeing a concerted effort from the retail industry coming up with unique ways to get consumers talking about their ads and purchasing their products," said Ed Keller, CEO, Engagement Labs. "Target, for example, launched an app called 'myCheckout' which enables its staff to process online transactions on behalf of customers when merchandise is out of stock. They also announced they would be lowering prices on hundreds of items so their shoppers can be confident they are getting the best deal. By understanding what its consumers are saying about their brand and their category, Target was able to identify marketing strategies which led to improved second-quarter sales, after four consecutive negative ones." Victoria's Secret remained in the top ten TotalSocial ranking, but dropped down four spots to number eight. The decline in the brand's performance was fueled by a drop in their online brand sharing score. Following the retailer's decision to eliminate its popular swimwear and apparel lines from its stores, Victoria's Secret received a great amount of criticism from its customers which also likely contributed to this decline. According to Engagement Labs, Under Armour, which fell out of the top ten to number 22, saw a decline in its sentiment and influence scores -- indicating the brand may be having a hard time connecting with the day-to-day influencers. However, the most substantial decline was in offline influence. Under Armour's performance also suffered when its CEO Kevin Plank announced he would join the White House Manufacturing Council, which caused some backlash among consumers. Additionally, the Company partnered with NBA star Stephen Curry to create a new sneaker, but this also backfired as consumers spoke negatively about the design on social media. Engagement Labs (TSX VENTURE: EL) provides the world's leading brands with a unique and powerful data and technology solution to drive sales growth and improve marketing ROI. Our TotalSocial® technology combines online social media listening metrics with the world's only ongoing measurement of offline word-of-mouth conversations into a single dashboard, to provide marketers with the ability to measure performance, diagnose areas of weakness and opportunity and identify specific strategies and tactics to increase sales and improve marketing ROI. TotalSocial is an "always-on" proprietary scoring system, based on the most important drivers of brand performance: Volume, Sentiment, Brand Sharing and Influence. TotalSocial tracks 500 brands across 16 major industry categories within the U.S., and 350 brands across 18 industry categories in the UK.